Google has made a significant change to its Android operating system after announcing that it will rebrand its Android Market app store and unify all multimedia content, which will now be known as ‘Google Play‘. The rebrand is not just a new name, the move represents Google’s ambition to bring all of its multimedia and content under one roof, to strengthen its appeal against competitors, most notably Apple. Over the coming few days, Android users will notice changes being made to services on their device. The Android Market will change to reflect its new name, the ‘Google Play Store’, while videos, books and music apps will be renamed to Google Play Movies, Google Play Books and Google Play Music apps. Once the changes have been made, rather than accessing services separately, they will come together and made available in one place through a Google account log-in. Google’s Chris Yerga told AllThingsD that Google is looking to provide users with a “one-stop shop” for a range of different media, which they will know can be played via the Web or their Android device. Executive chairman Eric Schmidt hinted that Google might introduce its own tablet and, given this move — which brings it into closer competition with Apple and Amazon — the possibility of a device emerging to battle the iPad and Kindle seems more likely. 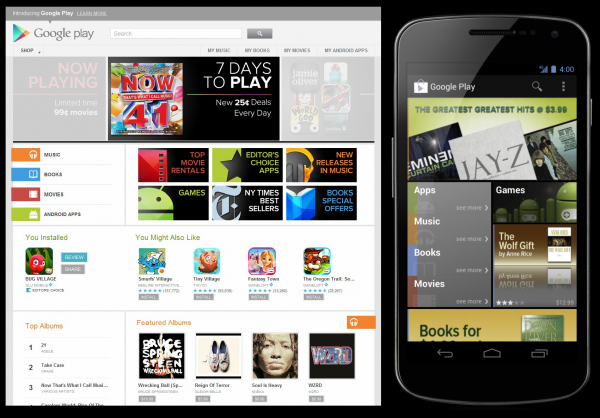 Might it even be called the Google Play? More details can be found in the video below from Google or on the Google Play website.